I couldn't do my foundation without these babies. Finding the right foundation can seem like mission impossible sometimes what with all the options for coverage, formula and finish (Don't even get me started about picking a color...), but I really think that finding the right tool to apply it is just as important. While there are some foundations that I like to use my fingers to apply and some days when my skin is so dry that a Beauty Blender sponge is the only thing that can make my foundation look halfway decent, I am totally a foundation brush kind of girl. But I hate with a white-hot passion the typical flat style foundation brush that for years I thought was the only type that existed. Whenever I used one of those things, I feel like I'm painting the side of a house instead of putting on makeup and I inevitably wind up with a streaky mess. No, I am devoted user of the fluffy style foundation brush, for lack of a better description. 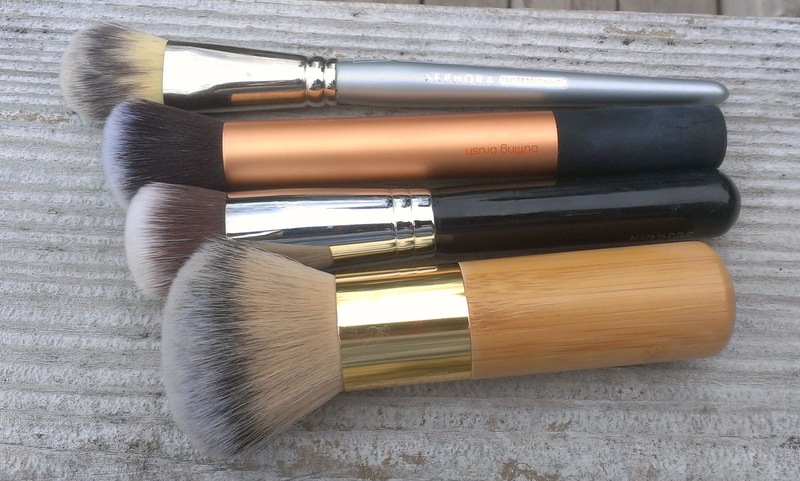 After years of trying pretty much every one out there, I've found four brushes that I can safely say are my favorites. They're all pretty similar, but I like having multiples on hand so I don't have to wash my brushes as often. I bought this brush about a year ago, and I believe that Sephora recently updated their Pro brush line so its name has changed from Airbrush Precision Foundation #56 to Pro Flawless Airbrush #56 and the handle and bristles are now black. Otherwise, the brush is exactly the same. Unlike the other two smaller brushes on my list, the Sephora #56 isn't round. Instead, it has a flat, almost oval shaped head that make it ideal for getting into all the nooks and crannies of your face. The bristles are densely packed so it blends very well, but there's just enough give to spread the foundation too so application is pretty much effortless. It's super soft too - but it is one of the most expensive brushes on the list and I can't really say that it does its job any better than the next two which are definitely more budget friendly. I have all of Sigma's synthetic kabuki brushes, and they're all excellent additions to any brush collection but my absolute favorite for applying foundation is definitely the F82 Round Kabuki. As its name implies, the F82 has a round shape that works well over the curves and contours of a face. It's bigger than the Sephora #56, so I feel like you can apply your foundation a little more quickly without worrying about streaks. The bristles are super soft and densely packed so it blends the makeup in like a dream. And at half the price of the Sephora brush, it seems like a real steal. The Real Techniques Buffing Brush is similar to Sigma F82 in that it's rounded and larger than the Sephora #56. 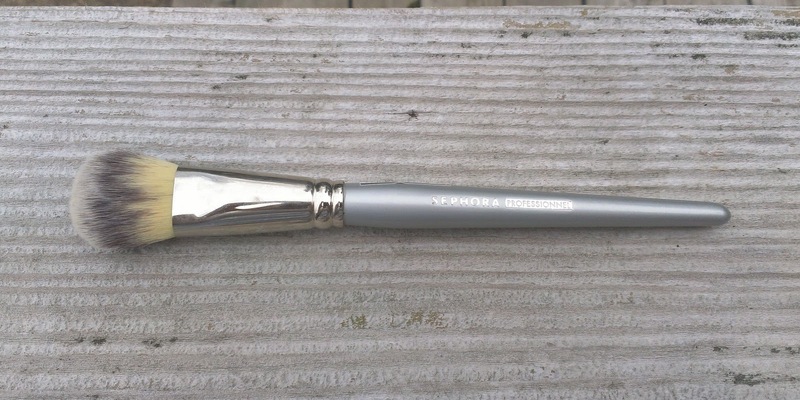 However, the Real Techniques brush has longer bristles than the F82 so it doesn't feel quite as dense, which allows it to apply a slightly sheerer coverage. It's super soft and easy to use - it's an ideal option if you don't really want to think too much about your foundation application but not wind up with a streaky mess. The one bummer about this brush is that you can't buy it on its own - it comes as part of the Real Techniques Core Collection along with a detailer brush, pointed foundation brush and contour brush (which I often use to blend concealer under the eyes). But the entire kit is only $17, so if you break it down, it's like each brush is just a little bit over $4, which is an amazing deal. I'm sure most beauty junkies know that these brushes are part of the collection designed by Samantha Chapman of the fabulous Pixiwoo sisters on YouTube, but it bears repeating just in case you haven't seen their amazing makeup tutorials. You can check out Sam and Nic's videos here. Now, unlike the other brushes on this list, I don't actually use the Tarte Airbrush Finish Bamboo Foundation Brush to apply foundation. But the brush is still amazingly dense - and when you stop to consider that it was meant specifically for use with Tarte's Amazonian Clay Foundation (at least that's the foundation it was paired with in the TSV kit), it actually makes sense as a foundation brush. The Amazonian Clay Foundation is pretty thick and a smaller or less dense brush usually doesn't do as good a job blending and smoothing that foundation in. The Airbrush Finish brush works like a charm with it. However, I love to use it after I've applied my foundation with one of the other brushes - I just lightly buff over my face with the Airbrush Finish to make sure that aren't any streaks or spots where I didn't blend well enough. It also seems to take off any excess foundation so I'm left with a pretty flawless (well, as close as I can get anyway) finish. If you plan to use the brush this way, I'm not sure I can justify the $32 price tag - I got it as part of a kit so it was a serious steal. However, if you use the Tarte Amazonian Clay Foundation or another super thick, full coverage foundation, this is a great brush for making sure you wind up with a smooth, even finish. What do you look for in a foundation brush? Do you have a favorite(s)?